Writing Proposals is a tedious task so it makes sense to create a template and change the bits that are relevant to the sales opportunity and customer’s needs. Writing proposals can be time consuming – take a standard template, add boilerplate text about the product or service you’re selling and then add in the standard disclaimers and pricing. The Faster you get Proposals & Quotes to a customer to a potential leads the more likely that you’ll get the business / work. Unfortunately, if the items you are selling are expensive – or you require detailed descriptions to differentiate you from the competition the need for a quality, detailed proposal can’t be avoided. 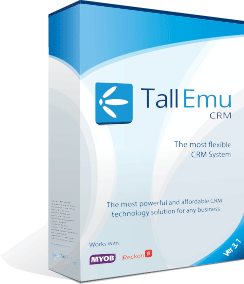 With Tall Emu CRM, we can take this tedious process and speed it up immensely. Create categories – and boilerplate descriptive text for your categories in Word. Create proposal templates in Word – a header and footer plus all standard boilerplate texts such as terms and conditions. Once this is done, to generate proposals in Tall Emu CRM is simple – add the products to a quote, press the send button and the quotation is built based on the word template, products selected. The proposal can then be sent from CRM – logged against the client – and of course it is automatically converted to PDF to avoid tampering. Any fields can be used – so if your CRM has been customised they can all be used in your proposal templates, right down to the salesman’s signature.